Photos are of model home in Pine Hollow. Elite Home Builders is thrilled to announce the opening of Pine Hollow, one of our newest communities located in Bellingham, MA! We have been building homes and communities for over 40 years, and are committed to offering luxurious, well-appointed homes to our clients. We want to ensure your satisfaction when it comes to design, construction, and finishes, as we know that investing in a home is one of the biggest and most important decisions you will ever make. Welcome to Bellingham's newest Condominium Community. This community has been professionally designed for individuals seeking an easy-living lifestyle at any age. 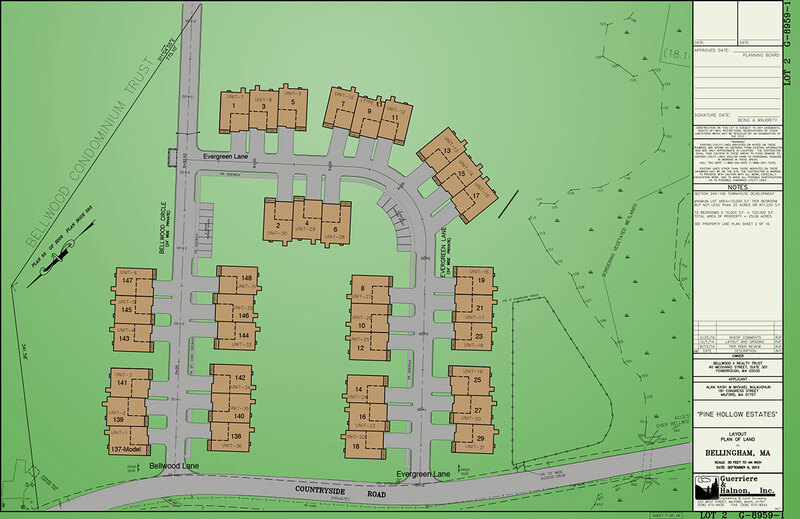 This 36-unit development consists of triplex condominiums surrounded by natural wooded beauty for desired privacy. Conveniently located at the intersection of Franklin Rt 140 and Bellingham Rt 126. Franklin Exit 17 bring you Franklin Shopping Center amenities such as Starbucks, Panera Bread, LongHorn Steakhouse, Marshalls – just to name a few. Bellingham Exit 18 brings Crossroads Shopping Center, Stall Brook Marketplace, and Bellingham shopping, which includes many amenities such as Whole Foods Market, Regal Cinemas, Home Depot, PetSmart, Walmart and much more. And let's not forget, close proximity to the infamous Patriots Place. Each townhome has been designed with an open concept to accommodate today's buyers' needs including 2-car garage, 2 bedrooms, 2.5 baths and optional finished basement.